One of the best aspects of being a tour guide at Antietam is the opportunity to meet simply wonderful people from all over the country. And I especially enjoy families with children, and I try to really connect with the kids and make it a fun and educational experience for them. This past Monday morning I met with a family from Vermont named “Bender.” It featured dad, mom, and two sons in 7th and 4th grades. Two older daughters are also in colleges in New England. Having had five sons, I’m especially partial toward “boy families.” And then, add to that when those boys are like I was as a kid – a reading and researching little dude – and I will be having an enjoyable time. I used to dazzle my parents with lists of isolated factoids from the reading that interested me, though would put them to sleep in an instant. Honestly and truthfully – my parents were fairly easily dazzled. Antietam was one of those topics that grabbed my attention as a little kid in New Jersey. I pestered my family until they finally agreed to bring me to the Battlefield for a visit, but it was the mid 1960s on a cold winter day, and there weren’t any Antietam Battlefield Guides in that era. My family got bored pretty quick and we did not stay as long as I desired … so I had to move here to make up for that! But I was never at the level of factoid information I heard on Monday with these two guys! I have also had two other experiences over the years with elementary-aged boys visiting at the Battlefield who knew an incredible amount of information about the Civil War and Antietam in particular. And then while driving through Keedysville, when mom found out that famous author Nora Roberts lives there , the boys went ballistic! They were at that moment totally sure their momma had agreed to go to Antietam merely under the pretense of meeting her beloved writer and visiting the Boonsboro Inn, etc. It was hilarious! Are there fewer kids like this in America than there used to be? I really don’t know, but I have met a lot of very well-educated and sharp children at Antietam. And I coached tons of great kids at Williamsport High School. Altogether, I’m slow to buy the argument that rising generations just don’t have the same “stuff” as those before them. Oh, yes … I did direct the Benders to Bender’s Tavern in Sharpsburg for lunch. Actually, since it was Veteran’s Day, the street was shut down for a ceremony and we could not drive past it at the end of our battlefield tour. 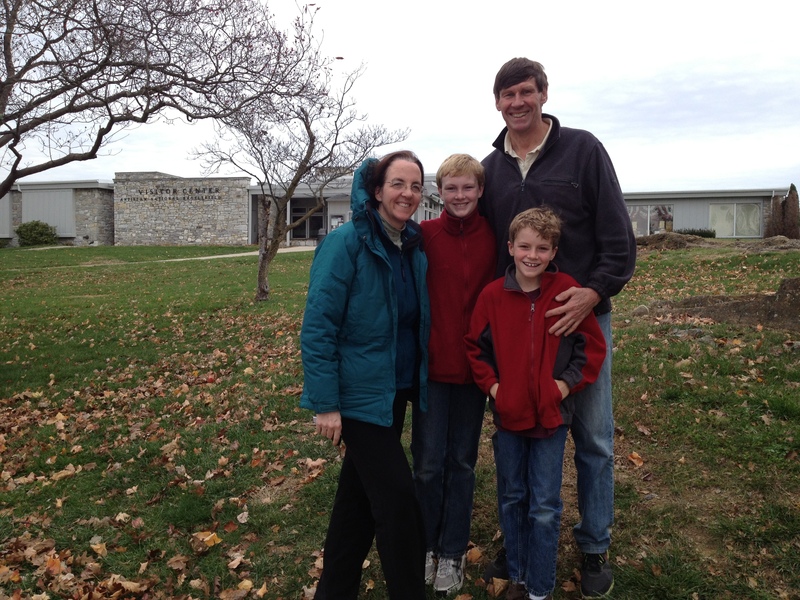 Posted by Randy Buchman on November 14, 2013 in Antietam / Battlefield Guides and tagged Antietam Battlefield Guides.